Despite being California's second largest city San Diego doesn't have much when it comes to fine dining. With little competition in the area, Addison has been racking up awards and recognition since they first opened its doors in 2006. The restaurant is run by Chef William Bradley, the San Diego native first discovered his love for cooking while working as a prep cook during his teenage years. Since then Chef Bradley has spent the lion's share of his career working at hotel restaurants including: the Azzura Point Restaurant in Coronado, Mary Elane's and the Hyatt Regency both in Scottsdale. Bradley has spent the last seven years at Addison where his contemporary French Cuisine is often called the best in the city. 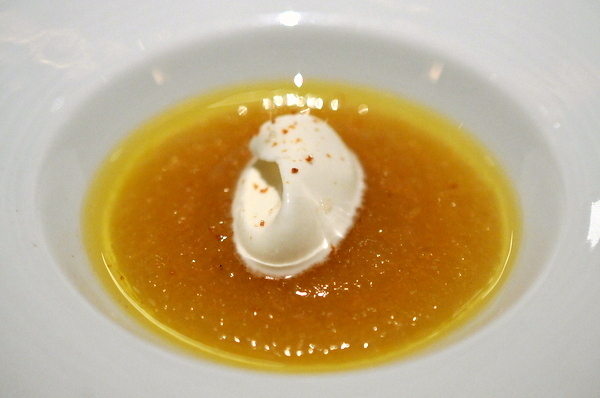 The idea of a pear gazpacho as a starter sounded a bit daunting but it was actually quite refreshing thanks to the light bracing tang of the yuzu cream which balanced the ripe sweetness of the pear. 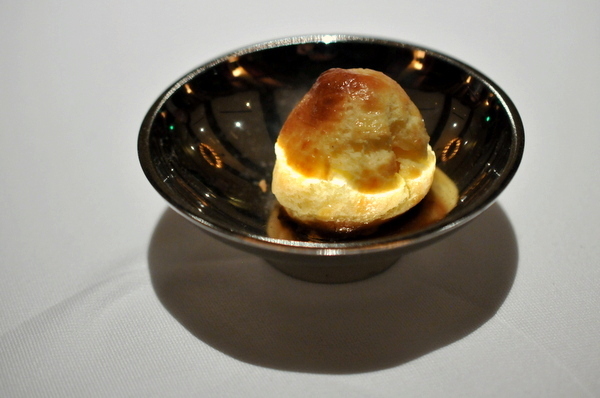 The first of the three breads was a house made Gougere. The cheese puff was a bit larger than most and stuffed with arguably the most delicious filling I've ever had in a Gougere. The sherry and Marscarpone filling is a bit runnier than most but fills the palate with a heady explosion of cheesy savor with a slight vinuous twang. The first official course consisted of two dainty Kumamotos drowned in a creamy horseradish sauce. The sauce adds a lush creamy mouth feel but the horseradish is fairly restrained leaving the uni-augmented saline sweetness of the Kumamotos intact. The accompanying wine was an equally bright affair with intense floral notes, ripe white fruit, and a bright grippy streak of acid. 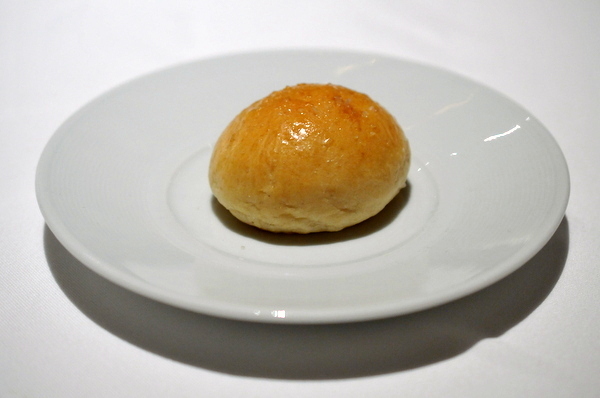 The final bread was a simple dinner roll, warm and flaky the brioche is already infused with a sweet buttery flavor. The butter is actually churned by hand in house and is one of the most flavorful butters that I've ever tasted. At the start of the meal I'd asked about extra courses so the staff brought out a plump St. Jacques covered in Golden Oscetra caviar. The duo are a natural pairing, boldly contrasting flavors of sweet and salty bound with an overarching brininess. 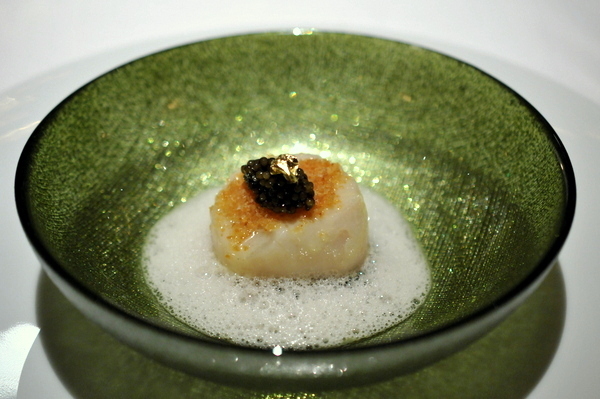 The champagne sauce and spinach provide a contrasting one-two punch of acidity and bitterness to temper the scallop and caviar. 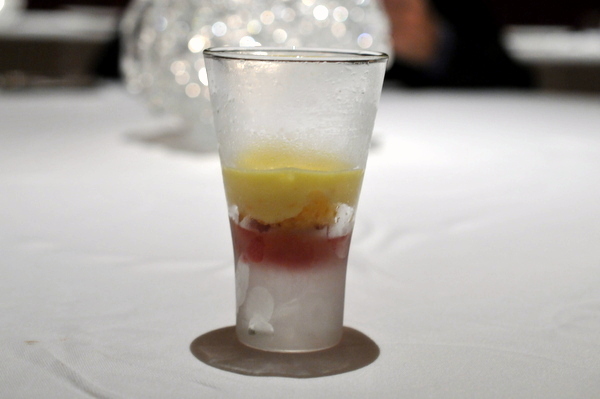 The presentation reminded me of Robuchon's signature scallop dish and though it didn't quite match up even drawing the comparisons speaks volumes about Addison's preparation. Sablefish, also known as Black Cod, is one of my favorite cooked fishes thanks to its beautiful flakiness and fatty heft coupled with a slight intrinsic sweetness. 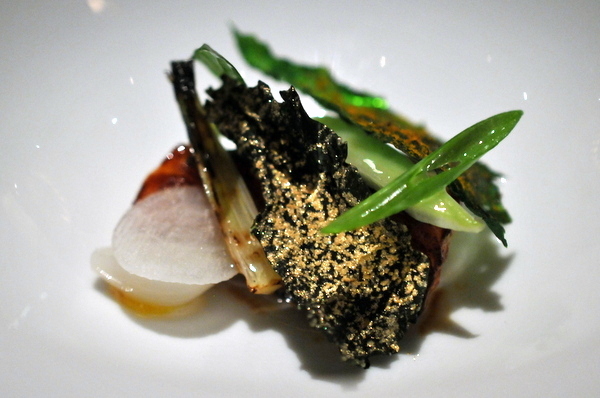 The caramelized exterior augments the fish's natural flavor while the charred vegetables add a nuanced bitter counterpoint. 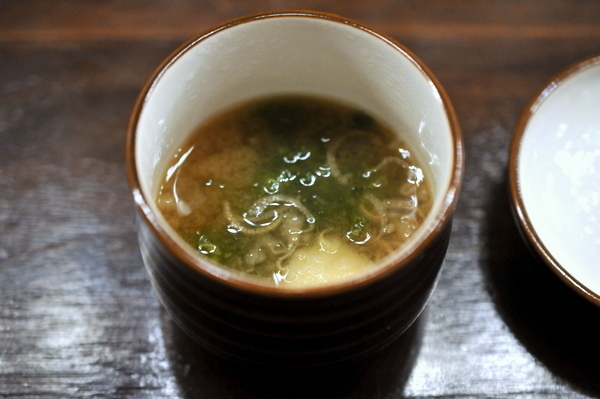 The dark onion dashi combined the caramelized sweetness of a French Onion Soup with the umami savor of a dashi and was arguably even more impressive than the fish. The Hûet has an explosive bouquet of tropical fruit with a restraining element of green minerality on the palate. 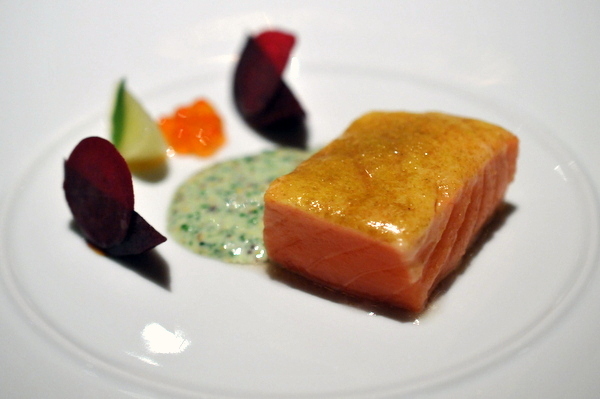 Our second fish course consisted of a beautifully butter roasted salmon. The exterior has a golden brown exterior but the inside is still a translucent raw pink. The raw fish has a touch of fishiness augmented by the mustard an salmon roe. The beets and apple have subtle mix of sweetness and acid, but on the whole the dish feels a bit sparse. 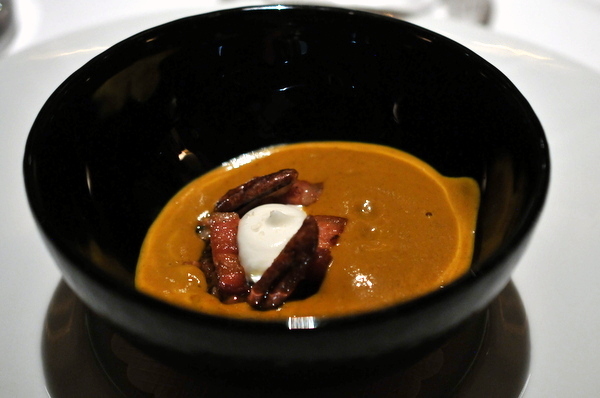 I was a bit surprised when a thick pumpkin veloute was poured over a small bowl of pork and pecan Chantilly cream. I typically find pumpkin a bit on the sweet side but this was nicely restrained. The soup has a soothing autumnal relish that fits the season tempered by the concentrated porcine savor of the pork belly. The accompanying wine is made from a rare grape varietal a ripe spicy red, sweet and lively but with a slight soapy funk. Next up was a huge nugget of rich veal sweetbread. 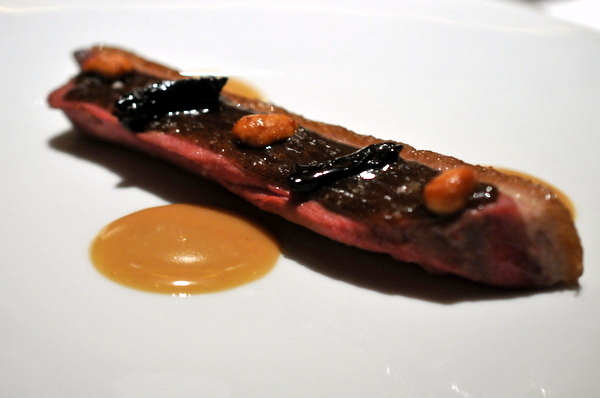 The veal jus was key here bringing forth a dark gamy relish to augment the otherwise monolithic sweetbread. The inclusion of broccoli was a bit puzzling and the oddly muted truffle shavings were a touch disappointing. It's clear the dish has so much potential but it felt like I was only tasting a fraction of the promised flavor. The final savory consisted of a roasted duck breast and side of "fried rice." The bird is decently tender but heavy on the nuttiness thanks to the combination of peanut and coffee. 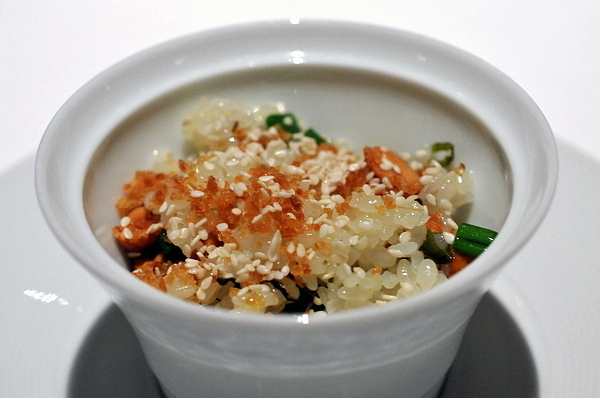 In fact the rice overshadows the bird, deftly mixing toasty nuts with a fresh scallion and a savory duck confit. Addison had five cheeses on offer. The Overall presentation felt a bit bare bones, some honey, preserves or even nut bread would have been a nice addition. First up was the Acapella, a grassy piquant goat's milk cheese from Andante Dairy. The Ardi Gasana was a medium bodied French Sheep's milk. 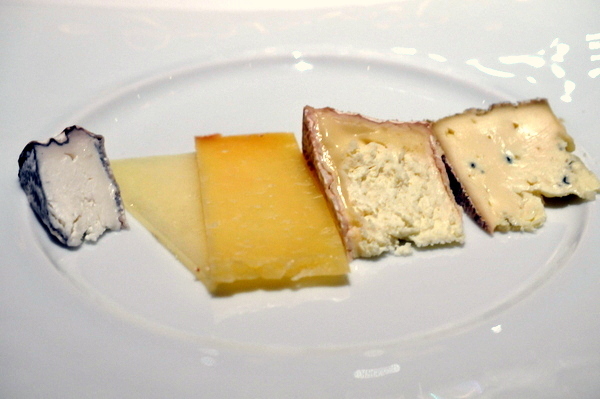 The Cabot Clothbound was my favorite of the quintet, the golden yellow cow's milk cheese was firm, salty, and nutty. The Largo was a second cheese from Soyung Scanlan and Andante Dairy, this a triple cream cheese that has a crumbly texture and earthy mushroom notes. The final cheese was a mild buttery blue cheese from France, creamy and rich with not much of the characteristic blue notes. The accompanying wine was a big sweet Riesling, mango and pineapple, with bright zippy acid and a touch of petrol. After the cheeses we were each given a shot glass full of bracing cranberry and orange sherbet as a palate cleanser before the desserts began in earnest. 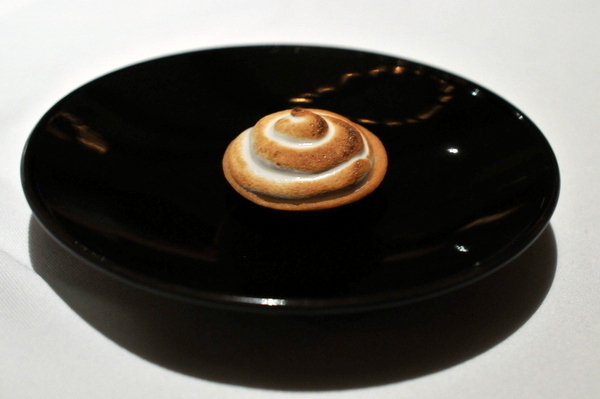 Our second dessert was a bite-sized meyer lemon tart, a classic mixture of frothy tart meyer lemon, sugary meringue, and crumbly buttery crust. 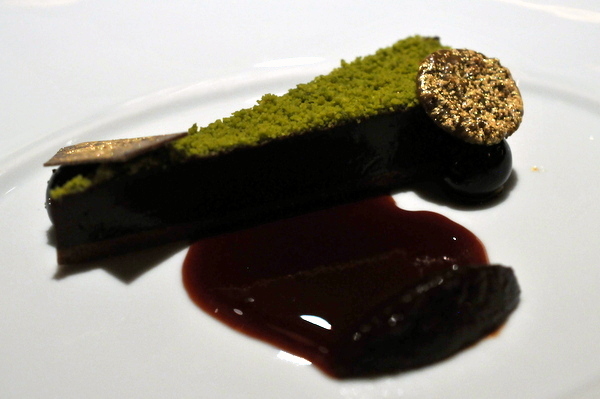 The final dessert was a rich chocolate tart. 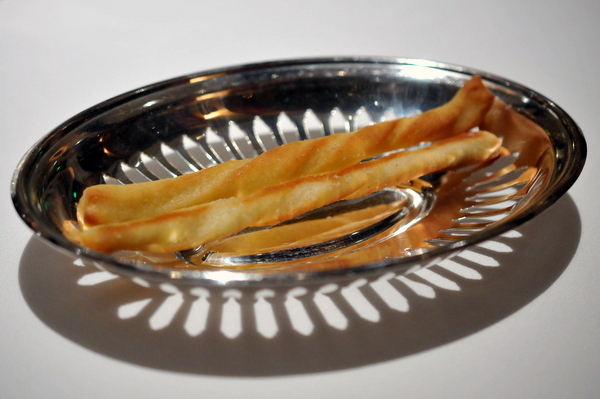 A thick fudgy layer of rich dark chocolate rests on thin layers of crisp puff pastry. The tarte is paired with classic accompaniments of bright sour cherry and pistachio and two gold flecked chocolate tuilles. 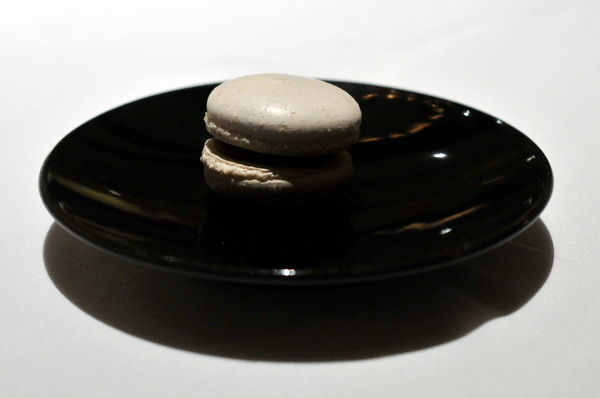 The final bite of the night was a classic chocolate and vanilla macaron with a touch of raspberry thrown in for good measure. Addison is generally considered the best restaurant in San Diego and I can see why. The food was thoughtfully designed and flawlessly executed in an opulent dining space and backed up with impeccable if reserved service. 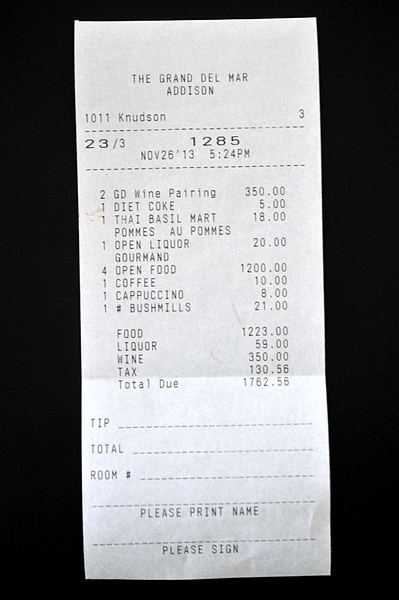 At the same time it also has the downsides associated with being a "hotel restaurant." 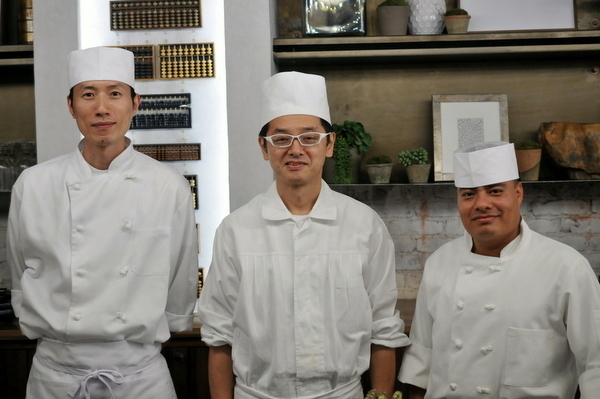 While I wouldn't call the food tired, Chef Bradley and his team definitely play it safe taking few risks and sticking to classic culinary techniques and flavors. 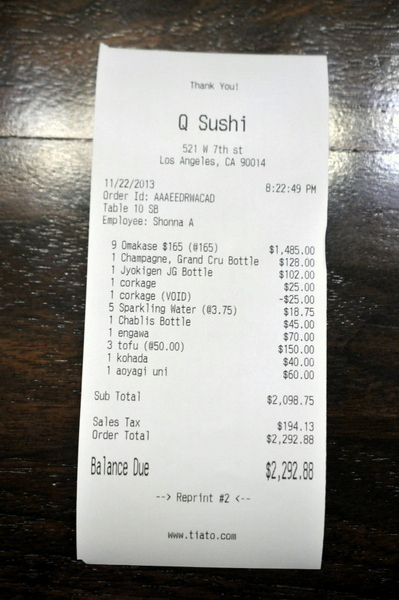 More than the food, I took exception with the price; I have no problem paying for food but at $520 per person the experience didn't come close to justifying the cost. Since mid-August I'd been hearing quite a bit of buzz around Q, a brand new purist sushi restaurant in downtown slated to open September 18. Invariably the opening was delayed and the restaurant had an extended friends and family period that just ended. I was lucky enough to secure a seat for opening night when one of my friends booked the entire 10-seat bar. 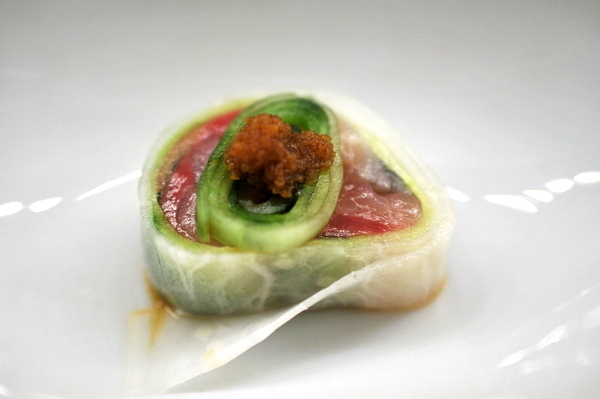 Funded by a group of high powered lawyers, Q sushi is run by Chef Hiroyuki Naruke and specializes in Edomaezushi. 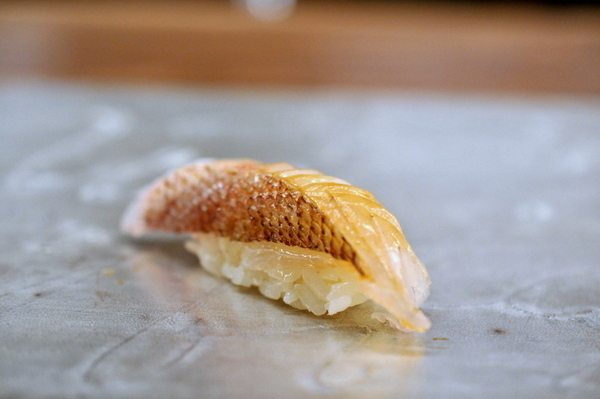 Prior to coming to Los Angeles, Chef Naruke spent more than 25 years as an Itamae, the last handful running his own 6-seat restaurant in Roppongi called Nogizaka Sushi. 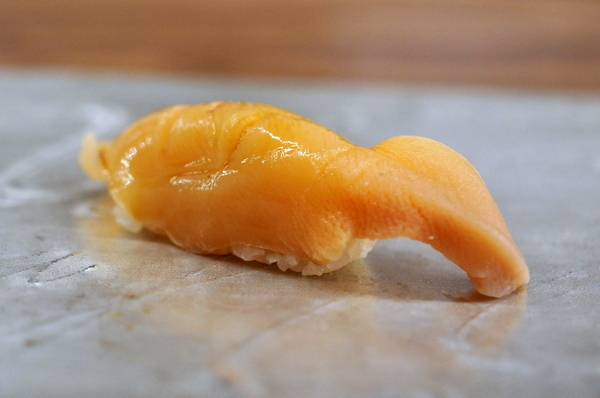 Now most purist sushi restaurants already claim to specialize in Edomaezushi so I was wondering how Q planned to differentiate itself; particularly with the brand new Sushi Zo barely a mile away. Like any culinary style, sushi has evolved with time, but Chef Hiro seeks to show sushi as it was not what it has evolved into today. In contrast to his emphasis on tradition when it comes to the food, the space is decidedly modern, lots of warm dark wood but very clean sleek lines and a low bar so diners have a clear view of the action. 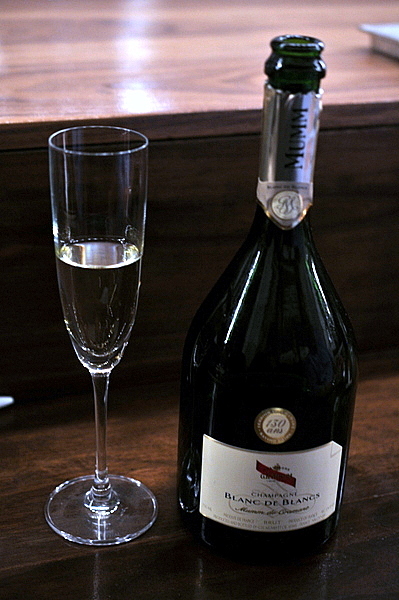 We opened the evening with a bottle of elegant Mumm Champagne. The bubbly has a pronounced nose of honeyed brioche coupled with a touch of lemon and stone fruit. Plenty of acid and minerality keep the finish dry and clean. 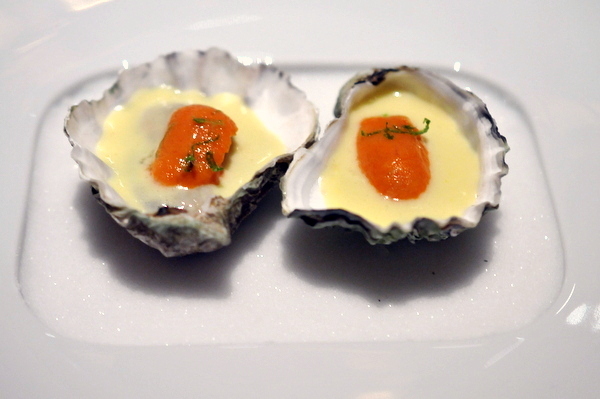 Our first course was a beautifully prepared example of my new favorite oyster. 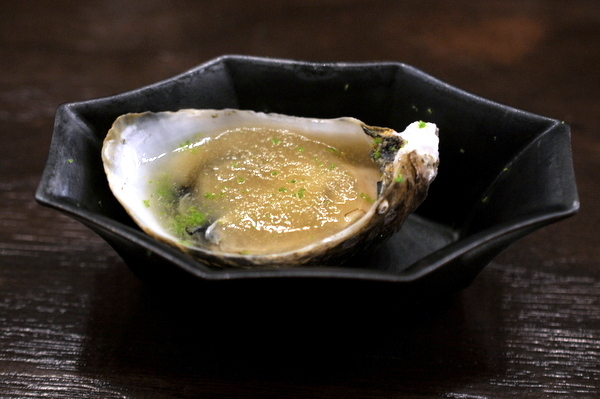 The Shigoku has a fantastically creamy body, drenched in a yuzu and dashi mixture which moderates the salinity while imparting a umami undertone and highlighting the oyster's sweetness. 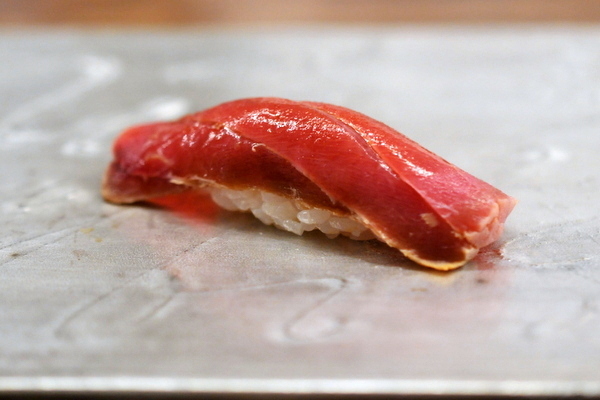 It goes without saying that the seared Spanish O-Toro could have easily stood on its own. The blistered and rough exterior provides a nice tactile contrast to the oil-soaked center. The chili sauce reminded me of of a Chinese XO Sauce, with a darker rich umami musk and hint of spice that accentuated the heft of the fish. I've come to realize that I'm very finicky when it comes to ankimo. I only enjoy the stuff when it has a creamy texture and this couldn't be further from that. With a dense almost plastic-y texture and boiled egg white funk this was probably the weakest course of the night for me. 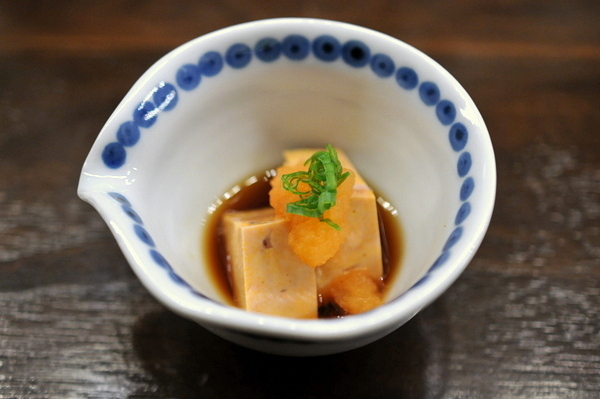 Despite this being the restaurant's official opening night much has already been written about Hiro-san's marinated Uni. 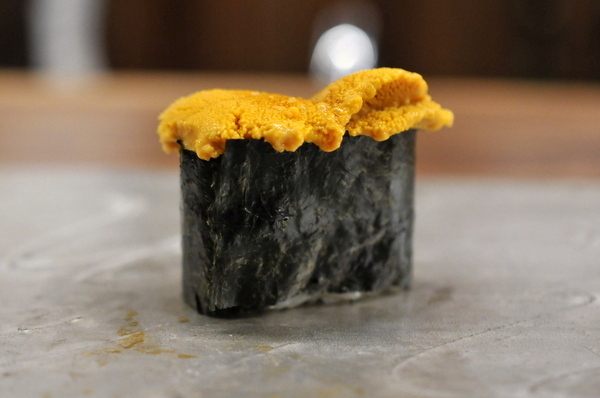 Preserved in Saikyo Miso, the uni loses much of it's moisture and salinity. The resulting roe has a dense, tacky creaminess and a blue cheese like pungency that is unlike anything I've ever tasted before. I was a bit taken aback after the first bite but the flavor grew on me quickly. To close the tsumami (appetizer) portion of the meal we were each given a small cup of miso soup filled with a mix of wakamae, daikon, and rice. The broth has a hearty soulful feel along with a smoke-tinged savor, the perfect counter for the cold night outside. Being the traditionalist that he is, I wasn't surprised to find that Hiro makes his own gari from Hawaiian ginger. 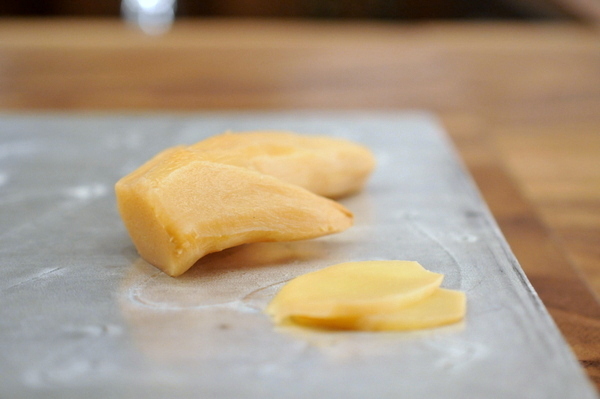 The result is a keen ginger-y heat and a firm succulent crunch that stands out from the typical fare. 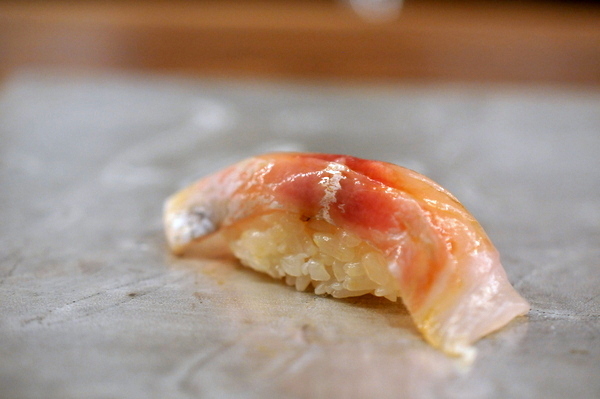 The nigiri portion of the meal began with a textbook Hirame Kobujime. Kobujime is a preservation method developed during the Edo period in Japan used to extend the life of raw fish before refrigeration. The technique involves salting then wrapping the fish in dried kelp. 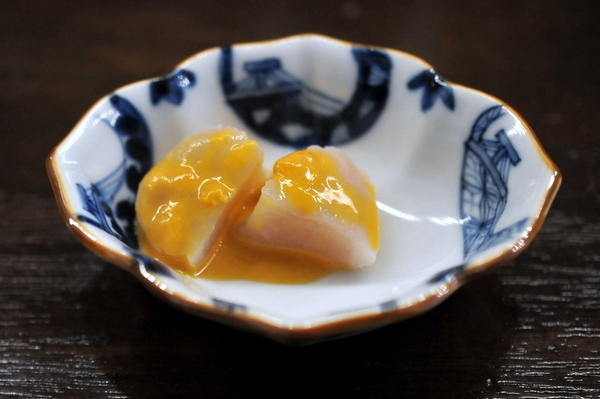 The preserved fish loses much of its water content resulting in a dense fleshiness along with a salt-laced buttery flavor. Next up was a flash seared baby snapper giving the mild fish a whisper of smoke. The texture is snappy with a touch of sinewy crunch making for a very satisfying textural experience. 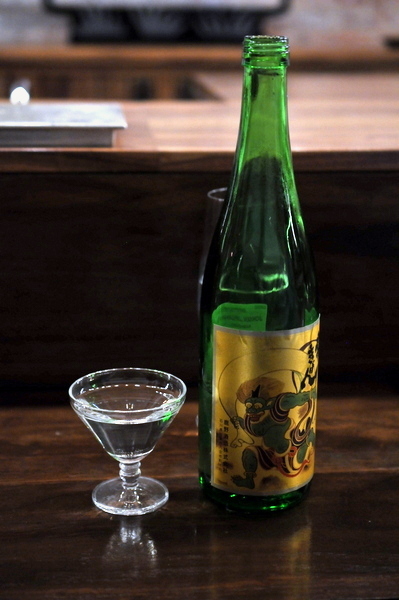 One of the diners brought a bottle of Kubota Manjyu to pair along with the sushi. 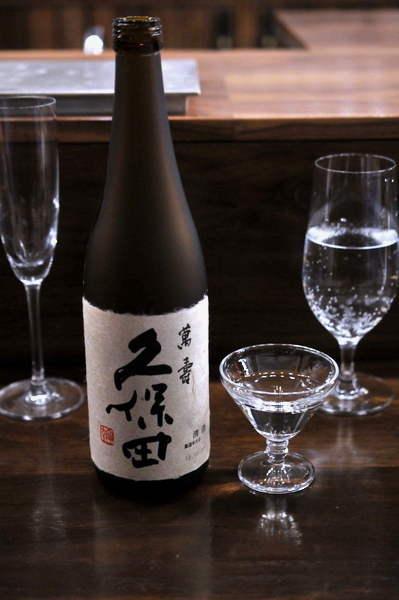 The tipple is clean with subtle floral notes and a subtly creamy mouth feel which went well with the deeper flavor profiles of the Edomae-style sushi. Thanks for the treat Brian. 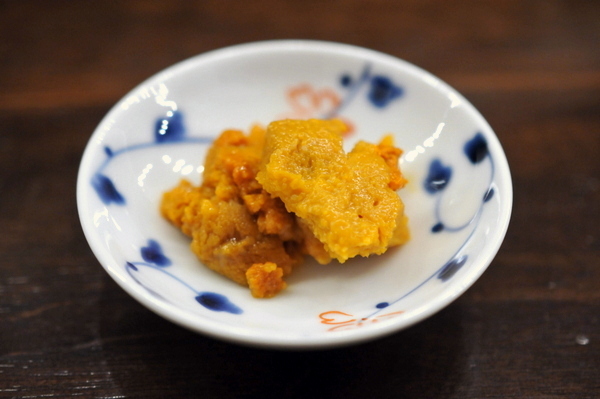 Like Kobujime, Zuke is another old fashioned method for preserving fish. 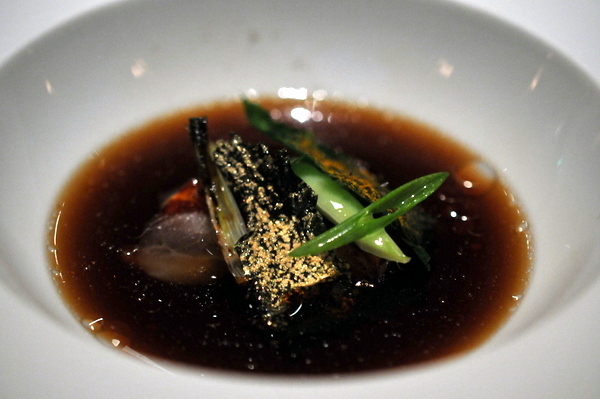 The fish is soaked in soy sauce where the high sodium content draws out the fish's extra water. Though rendered moot with modern refrigeration, I enjoyed the subtle changes the technique imparts to the fish. 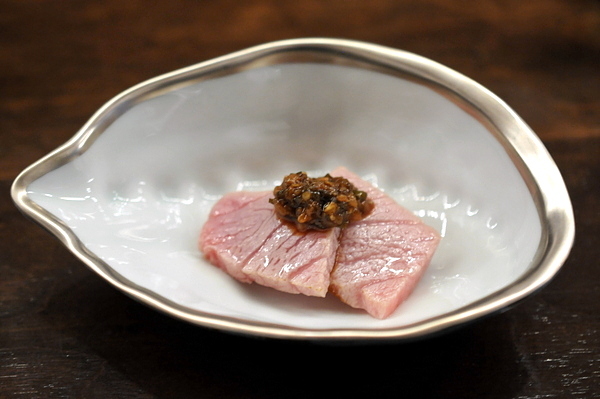 Not quite as extreme as Kobujime, the soy marinade still preserves much of the natural texture as well as the clean almost metallic twang of the tuna. 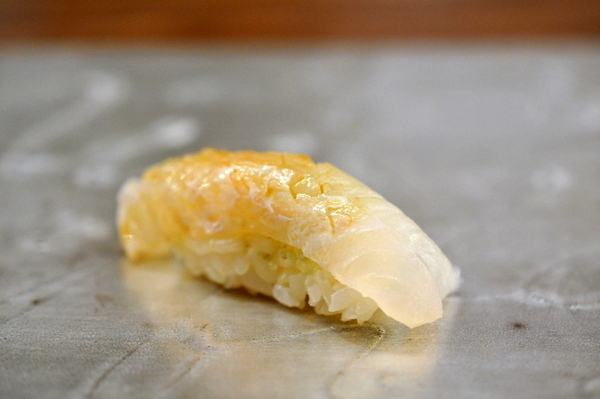 Like many of the fishes, Hiro-san's Aoyagi defies conventional expectations as well. The flesh is tender and almost spongy with a relatively mild flavor. Though there is a touch of that ocean-y fragrance it pales in comparison to the clam's intrinsic sweetness. 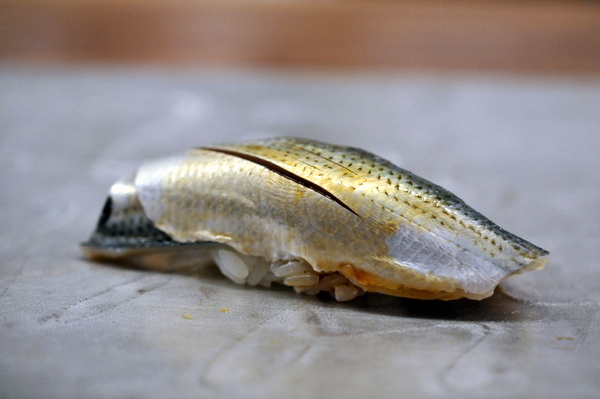 With a deep red core that lightens to a white band at the edge and flecks of silver thrown in, Kurodai has one of the most arresting color patterns of any sushi fish. Texturally this had a fir snap to it, there was a touch of sinew as well but I didn't mind the texture. 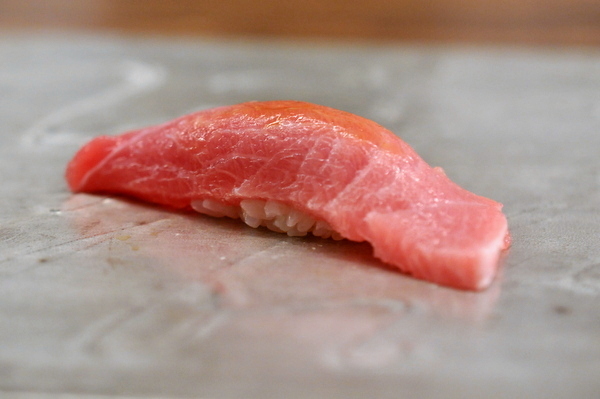 Unlike the majority of fishes at Q, the toro is served fresh. First up was a medium fatty that combined the best elements of both Akami, and O-Toro. The fattier elements are immediately apparent in the creamy mouth feel and rich oily flavor but there is an underlying steely note that lingers on the finish. 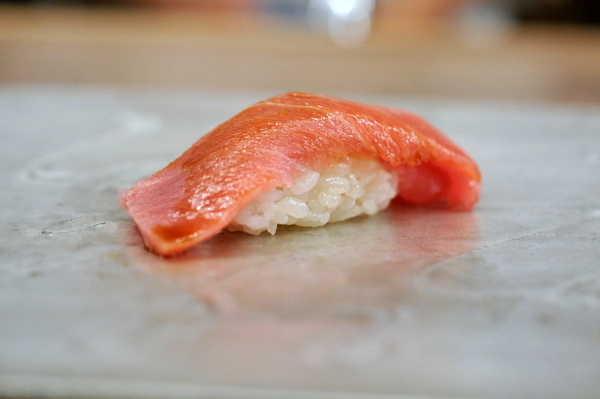 Hot on the heels of the Chu-Toro came the real thing, bright pink and threaded with tiny white veins of fat the O-Toro is an example of full-throated buttery decadence. Next up was a prototypical Kohada, beneath the beautiful silver-blue skin lies an unabashedly dense flesh exudes dark earthy oil. The Kubota dispensed with, we decided to order one of the more full bodied sakes the restaurant had on offer. The rich aromas of pear are coupled with a yeasty creamy verve that complimented the earthy weight of Hiro's rice. 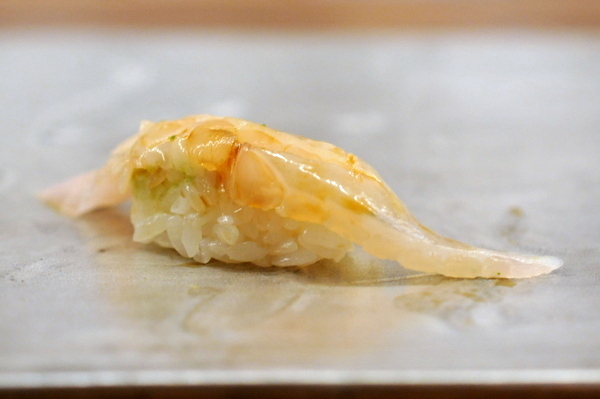 Prior to this I've only seen Shiro Ebi at Urasawa and have always found it inferior to the more prevalent amaebi. Hiro's had a keen sweetness that I've never noticed as well as a vegetal foil from the crispy nori wrapper. A fantastically textured scallop, the lithe jellied texture and wonderful saline sweetness are as good as any I've ever tasted. This was quintessential uni, the creamy velvety texture is like sin on the tongue while the flavor calls to mind the richness of foie tinged with a cool ocean-y verve. This was a fantastic anago. 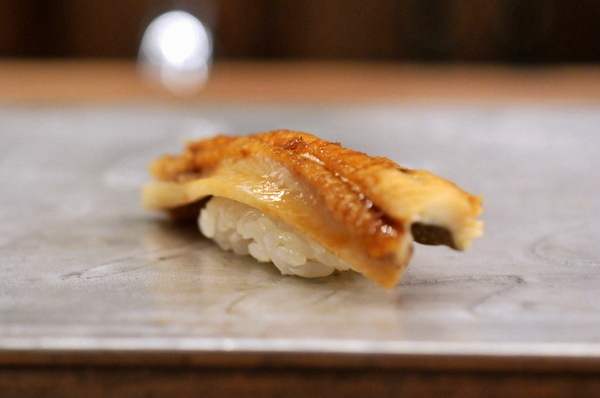 Most preparations rely heavily on the sauce and though Hiro-san does dress his with tsume, he is sparing with the stuff which makes it possible to appreciate the natural flavors of the eel. 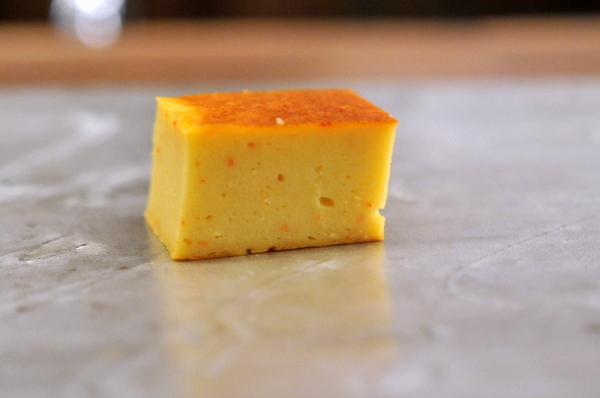 The tamago looks like a pound cake but has a dense nuttiness touched with a faint salty-sweetness that felt out of place in an egg dish. Our server Mai let us in on a little secret, that Hiro-san's Tamago is actually 60% shrimp which would account for the unique flavor. The entire party was still hungry after the Tamago so we pleaded with Hiro to empty his fish case. The first supplement was a fantastic scottish salmon, dense, supple, and buttery kissed with a hint of smoke that fits perfectly with the fish. A number of my dining companions mistook this for another scallop but it was actually the adductor muscle of an orange clam. The texture is reminiscent of a scallop though a fair bit firmer. 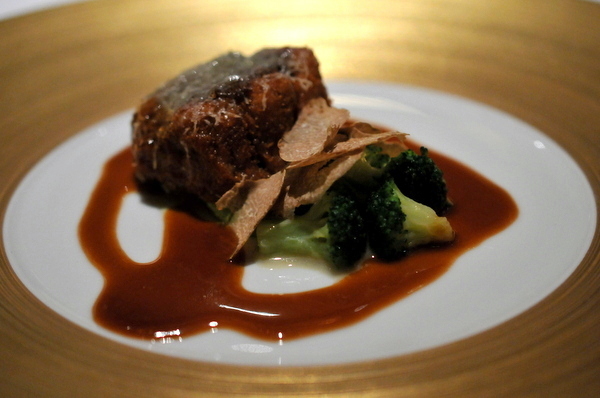 The dark earthy tones of the muscle are beautifully accented with a delectable uni sauce. The Saba was absolutely sublime tonight. Served fresh, the fish has a lissome slickness to it. 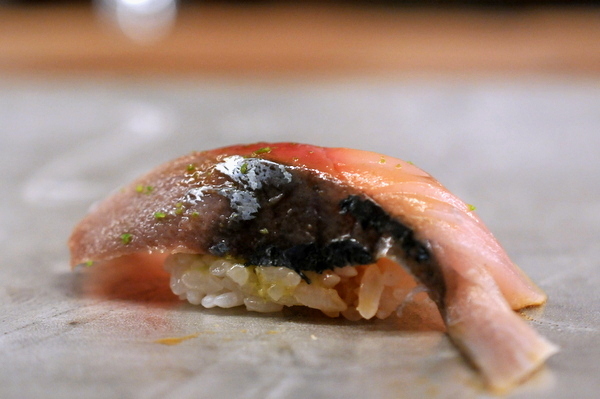 There is a pronounce oiliness to the Mackerel but the dusting of yuzu zest provides a countervailing sense of lift. The 2011 Droin doesn't have much complexity or mystery, but there is a very approachable mix of fresh apple, and lemon zest. 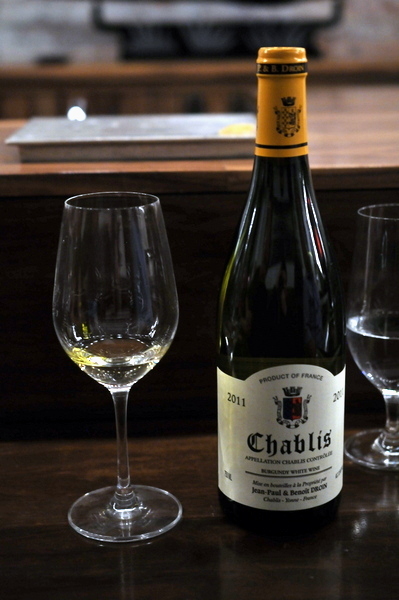 The wine lacks the typical tension and is perhaps a bit fat but still a very enjoyable if somewhat atypical entry-level Chablis. 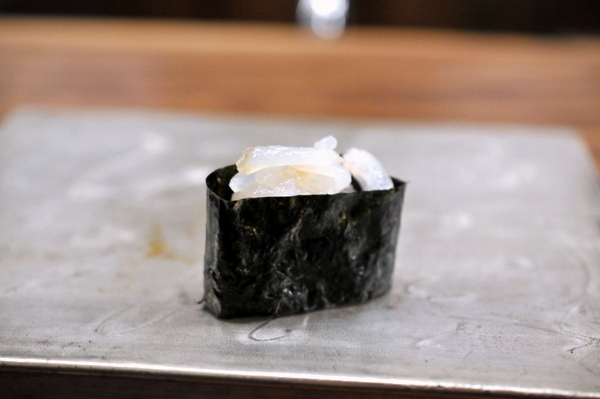 The engawa proved to be one of the strongest pieces of the night. Along with its uniquely muscled texture the fish has an earthy savor that leaves a pleasing whisper of buttery richness on the tastebuds. For our last "savory" Hiro-san served us a Kohada roll, pairing the silver-skinned fish with finely julienned cucumber and once again the vegetable is an effective foil for the oily weight of the fish. 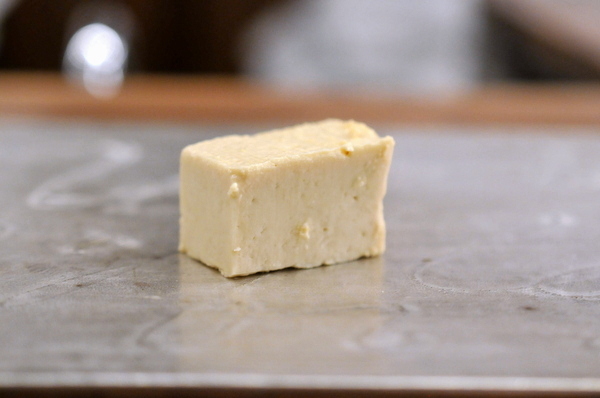 Since we'd already had our tamago, Hiro-san decided to serve us pieces of his homemade miso tofu. Admittedly this was a bit of a struggle for me, a bit nutty but with a funky yeasty undertone, it reminded me more of a medium-bodied cheese than tofu. 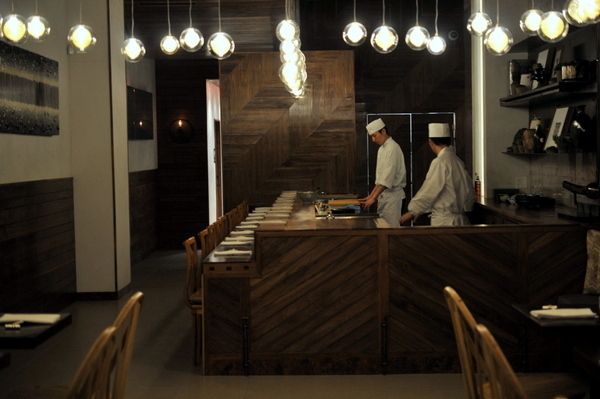 Most traditional sushi chefs tend to have an air of quiet intimidation about them. Hiro-san however gives off a calm humility seemingly content to craft immaculate pieces of nigiri for his guest's enjoyment. For the most part he seems to have a fairly calm demeanor though he did occasionally joke with us. 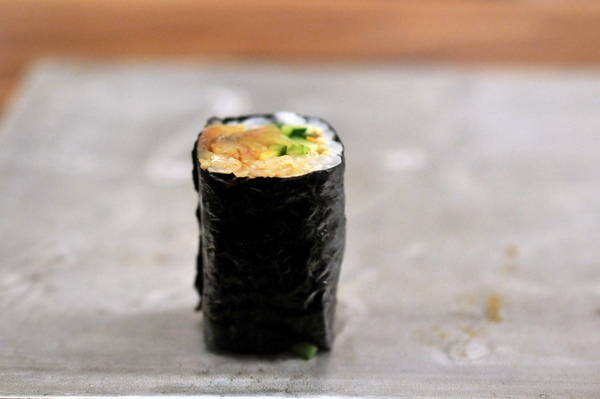 Apparently, this was my first experience with true Edomae style sushi. With effective refrigeration readily available these days, the emphasis on preservation techniques used during the Edo-period have faded. 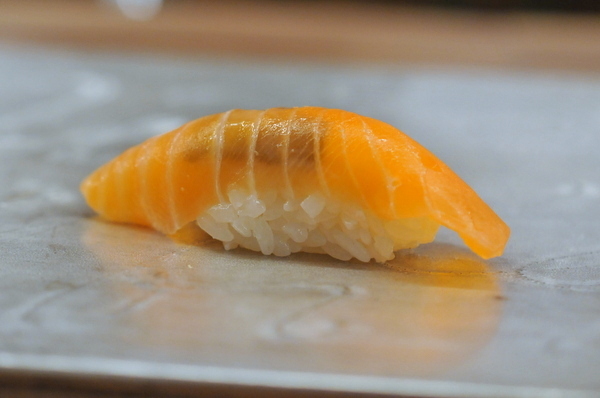 As one of my companions pointed out most sushi today all has a very similar texture and I've seen this more and more myself. At Q the difference between textures is quite pronounced especially with the cured or marinated items. Likewise familiar fishes take on new more umami-heavy flavor profiles thanks to the Nekaseru fermentation technique that Hiro employs. The rice is also more heavily flavored and a bit denser than many other restaurants. To fully appreciate Chef Hiro's talent, diners will have to throw out their expectations of what defines traditional sushi built up from places like Mori or Zo and approach Q with an open mind.